Rachid Mechouet joined Arig in November 2010 in the Claims and Technical Accounting department and assumed the role of Director. He has joined General Management Team in January 2017. 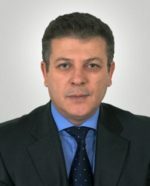 He has more than 25 years of reinsurance experience having worked with CCR (Algeria), Arig (Tunis) and Med Re (London) before coming back to Arig in 2010 as Director – Claims & Technical Accounts.